Hi Everyone! Sorry it has been so long! I've been working on a few projects one of which is a new website, so stay tuned. In the meantime here is a video showing you how I've tried to make my finger detangling sessions slightly easier by stretching my hair with African threading before hand. This idea came to me as I thought about ways I could improve the detangling time. I realised something quite obvious. Perhaps I should have my hair super straight before starting of course! July and August have been busy busy busy. The summer holidays are here and the children are off from school which means there has been less time to work on hair videos. With that said I've decided to put my reviews of UK products on hold this year and perhaps resume it another time. I really enjoyed using the products and discovering the growing number of black owned UK companies producing natural hair products sans the drying substances that are so prevalent in the majority of hair care products today. I'm currently working on a few projects of my own at the moment which has further reduced the time I've been able to spend on reviewing other products. I would also like to do more hair styling videos in the near future but we'll have to see if time permits! Anyway, so what's been going on with my own regime? As it's been summer I should have been increasing my moisture intake however I've slacked on this a little and of course your hair always tells you how it's feeling. I've noticed some smaller broken hairs when I've been moisturising and sealing my hair so I know it's time for me to up the moisture intake and also have a trim too. I'm also due a henna treatment but I'm waiting for my moisture levels to increase as It seems that the more I henna the less porous my hair becomes. However there's something else I want to try out in my regime, something that I've been hearing more and more about in the natural hair community and that's the water only washing method. This is when you use warm water to wash your hair each day and only use natural oils to condition your hair in the process. In a way I already do this method as I don't use shampoo any more but I still use conditioner or ACV to cleanse my hair. I want to try this method for 14 days to see what happens. I'll be using coconut oil so my hair doesn't dry out too much. The coconut oil also helps to impart shine as well as ensuring hygral fatigue doesn't affect my hair too much with the constant wetting and drying of my hair. I'm interested to see whether I might get the same results as the MHM (Maximum Hydration Method) but with a simpler regime that could suit me when I want to wear my hair out in an un stretched state without it tangling too much. What I plan to do is divide my hair into two braids then simply wash my hair in the shower scrinching and preening as I go, removing shed hairs then braid up each section. Then I'll quickly run cold water over the braids ( to close the cuticles) , dry my hair with a cotton T-shirt and press through some coconut oil and that's it. Check out the video below to hear more about the process. I recently cut roughly 4cm off my ends, I think I was in desperate need of a cut as my ends we're frequently tangling and had become thin, and in addition to my already fine hair it did not look good. I think I need to increase my moisture load. Over the last few months I have tried to gradually reduce the amount of times I wash my hair. I have also chosen to do more long term protective styles lasting two weeks or more. I thought this would help me to retain length since I wasn't often going through the wash process, which is usually when my hair forms knots and tangles. I also read of bloggers like Cipriana from UrbanBushbabes who only wash and deep condition once a month but still manage to maintain the length and health of their hair. I thought that sounded great. I love the idea of doing less and less to my hair! However I don't think that approach worked so well for me and perhaps it was one of the reasons for my damaged ends and single strand knots (ssk's). Then I thought back to the first year of my natural hair journey and how I never really had ssk's and bad tangles. I guess one reason why was because my hair was shorter, but also I remember washing my hair twice in the week and regularly applying leave in conditioner and sealing. My ends were well moisturised and stayed that way 1. because lots of water was able to penetrate the hair strand and 2. I wasn't in the habit of frequently stretching my hair. 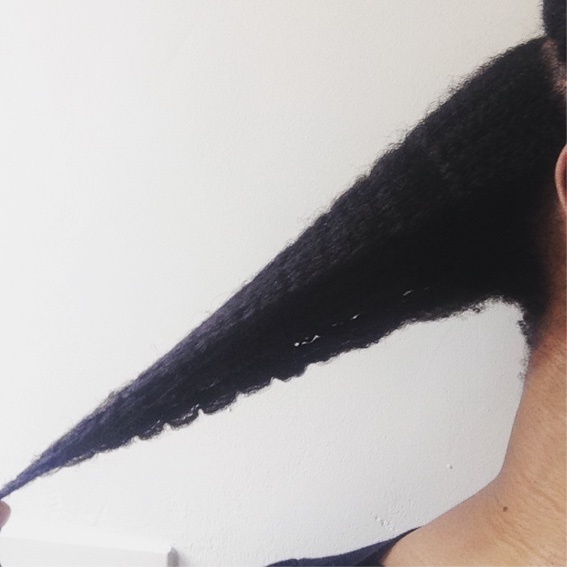 Since discovering the african threading method I have been stretching my hair after every wash and although I spritz my hair between washes I've learnt that my hair and scalp benefit from a thorough soaking and kept in a style that allows the hairs to clump and curl in its natural pattern. I think I lose moisture rapidly when my hair is stretch out too much. I also looked at photos I took of my hair when I was tracking it's growth last year and I noticed that my hair hasn't gained much length at the fringe and crown area since then. This is not surprising because the hair at my crown is coarse and breaks really easily and my fringe hair seems to form a bountiful amount of ssk's (which I've had to cut off) probably because I manipulate that area the most and it probably needs extra moisture which I've not been careful to give it and likewise the crown of my head. Keeping my hair in chunky twists during the week. Applying oil to the ends a few times a week or introduce oil rinsing. Do a short deep condition on the first wash day and perhaps a longer one on the second wash day. Find styles that don't require hair to be super stretched. Start to document my growth again by taking one photo at the beginning of each month. Then I will be able to see if the new regime is working. 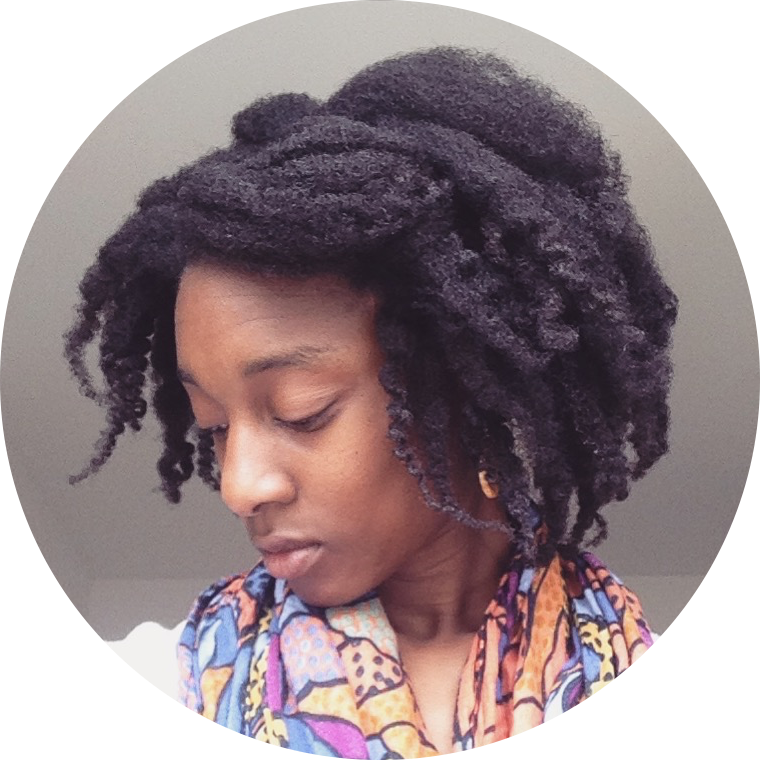 Simple chunky twist style which allows my hair to stay moisturised for longer. 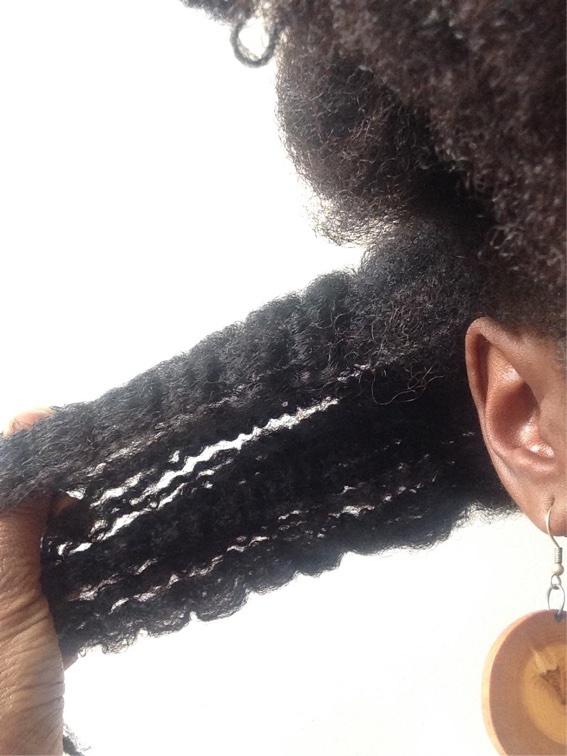 Moisture and shrinkage go hand in hand. I've learnt so much about my natural hair over the last 3 years but this is only because I've taken note of how my hair reacts to different regimes and products. I definitely think it's great to leave you hair out of weaves and braids for some of the time so you can better understand how to care for your hair and what it likes and dislikes. There's a lot of trial and error with natural haircare but I'm enjoying the journey because the further you go along the road the more you'll be able to refine your regime, therefore making caring for your hair as easy as pie!